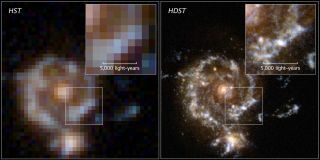 This side by side simulated image of a galaxy 10 billion light years away demonstrates how images taken by HDST (right) would compare to those taken by Hubble (left). HDST's mirror would be more than 5 times the width of Hubble's mirror, offering 25 times Hubble's resolving power. Hubble detects the galaxy’s bulge and disk but only HDST resolves the galaxy’s star forming regions and its nearby dwarf satellite. NEW YORK – A successor to NASA's famous Hubble Space Telescope and the soon-to-be-launched James Webb Space Telescope is already in the planning stages by a group of leading astronomers. The proposed High Definition Space Telescope, or HDST, would have 25 times the resolution of Hubble and would serve as a "flagship observatory" for the global astronomical community. One of its primary scientific objectives would be to study the atmospheres of dozens of Earth-like alien planets, looking for signs of life. The report was produced by the Association of Universities for Research in Astronomy (AURA), which is involved with many major telescopes and space science facilities including the James Webb Space Telescope (JWST), the Gemini Observatory and the Space Telescope Science Institute in Baltimore. The new report gives a launch window for the proposed HDST of sometime in the 2030s. The telescope would view the universe in ultraviolet, optical and infrared light, with a 39-foot-wide (12 meters) multipiece mirror (similar to the honeycomblike mirror on the James Webb Space Telescope). Hubble's primary mirror is 7.8 feet (2.4 m) wide, while that of JWST is 16.4 feet (5.4 m) wide. Members of the AURA HDST committee said the increase in resolution from Hubble to HDST would be equivalent to the resolution increase from the earliest black-and-white televisions, which had a resolution of about 780 by 420 pixels, to the high-definition screens available today, which are in the range of 3820 by 2160 pixels. "Bigger telescopes see deeper into space with better detail. Period," Tyson said to reporters prior to the public event. "And it's not just that you will see the objects you already know about better. Our experience tells us that all-new phenomena, undreamt of, manifest themselves in the face of this higher level of technology. And that is what we're actually after here — not simply understanding what we already know a little better. [The HDST has] the potential to make significant, field-changing discoveries." This sentiment was echoed by Michael Shara, a curator in the department of astrophysics at AMNH, speaking to reporters. Shara explained that in addition to an increase in resolution of images, overall the HDST would be "100 to 1,000 times as powerful as Hubble." "Any time you gain a factor of 100 to 1,000 … you find new astrophysical phenomena," Shara said. As an example, he and other speakers referenced the accelerating expansion of the universe, caused by what scientists now call dark energy, which was discovered using observations by Hubble but was not predicted by scientists prior to the telescope's launch. The scientists who uncovered the phenomenon were awarded the Nobel Prize in physics in 2011. A large portion of the AURA report is dedicated to explaining HDST's mission to identify "several dozen" Earth-like planets and analyze their atmospheres for signs of life. HDST's primary search method would involve a coronagraph, an instrument that blocks the light from a star in order to better observe planets orbiting that star. Sarah Seager, co-chair of the HDST committee and a professor of planetary science and physics at MIT, said no other planned or existing telescope will be able to find anywhere near that many Earth-like planets. The HDST would serve many other scientific objectives, the scientists said. Julianne Dalcanton, a professor of astronomy at the University of Washington and co-chair of AURA's HDST committee, said the new telescope would be a "flagship observatory," meaning it would serve a wide range of scientific pursuits, just like Hubble. Scientists around the world would be able to submit proposals for what the telescope should study (this is the case with telescopes like Hubble, but it is in contrast to single-purpose observatories like the Kepler space telescope, which was designed to search only for exoplanets passing in front of their parent stars). Other potential topics of exploration by the HDST listed in the report encompass nearly all major areas in astronomy. They include studies of large objects like galaxies (both nearby and at the edge of the observable universe) and star-forming gas clouds, as well as studies of planets, moons and other bodies in our own solar system. Dalcanton said the HDST could potentially find planets larger than Earth orbiting the sun in the Kuiper belt or the Oort Cloud, two regions that lie beyond the orbit of Neptune. Other topics of study would include the dawn of galaxy formation in the universe, and star and planet formation in the Milky Way, among others. In terms of money, Marc Postman, an HDST committee member and an astronomer at the Space Telescope Science Institute, said the cost of the HDST would be "on the order of the James Webb telescope," which he later specified as being between $8 billion and $9 billion. "I would love to see some astronauts out there at L2," Dalcanton said. "We don't make this a requirement in the report. … The servicing would be fantastic, should the infrastructure come." Sending astronauts to L2 would be the farthest humans had ever traveled from Earth. During his presentation to the public, Tyson pointed out that astronaut Mike Massimino was in the audience and asked him, "Mike, would you go to L2?" Massimino responded with a quick "Yes." The panel of scientists said the HDST report was released in anticipation of the 2020 Astronomy and Astrophysics Decadal Survey by the National Research Council of the National Academy of Sciences. The decadal survey is published every 10 years and makes recommendations for projects and pursuits that the global astronomical community should prioritize. The recommendations of the survey often influence which projects and instruments governments and agencies choose to fund.